You’re about to see a killer resume follow-up email sample. Better yet? You’re going to learn how to write one yourself. When following up on a job application, you’re treading on very thin ice. You don’t want to seem too pushy or impolite. But not following up might mean another candidate will fill your spot. Luckily, there are some proven ways of following up on a job application. Play it right and you’ll dramatically boost your chances of getting hired. A step-by-step formula for following up on every job application. How to follow up on a job application to land more interviews. Sample follow-up email better than 9 out of 10 other ones. How to follow up on a job application status by phone. Want to save time and have your resume ready in 5 minutes? Try our resume builder. It’s fast and easy to use. Plus, you'll get tips and right vs. wrong examples while writing your resume. See 20+ resume templates and create your resume here. Resume Example made with our builder - See more templates and create your resume here. So you’ve submitted your resume. Congratulations. But it’s just the beginning of the hiring process. It’s frustrating, I know. Yet you have to give the employers some time to review your application before you can follow up. When to follow up on a job application? There’s no fixed rule, but in general: no sooner than a week after submitting your resume. Two weeks and no reply? Now you definitely have to follow up. Pro Tip: Before you follow up, have another look at the job posting. Sometimes employers explicitly state that they do not want you to reach out to them to ask about your application status at this stage. In other cases, the exact response date is provided in the job ad. Play by the rules. Following up before the due date will be rude at best and will hamper your chances of landing the job at worst. Alright, so you’ve waited. It’s been a week or two since you applied and there’s still no answer. Game on! Go through your business and professional contacts to see if you know anyone from the company. If you do, ask them to inform the proper hiring manager about your application, or to put you in touch with someone in charge of the recruitment. Don't have any contacts in the company? First, check if contact information is provided in the job offer. If you’ve applied via a job board and there’s no direct email address in the job posting, check the company’s website for your hiring manager’s email address. Not there? Call the company’s main desk and simply ask. That’ll do the trick. Use a clear subject line, for example: Following up on a job application for [position title]. Be polite and humble in the body of your message. Say you’re still interested and reiterate why you’re the perfect fit. Keep the resume follow-up email short. Let’s see how it works in practice. Last week, I applied for the position of [position title]. I would like to kindly ask you if you could provide me with your decision timeline. I am very enthusiastic at the prospect of joining your team and leveraging [your specific skills, knowledge, and experience] to help you [what profit you’d bring to the company]. Please let me know if you need any more details about my application. I look forward to speaking with you and sharing my ideas on how to help you with your upcoming challenges. You might feel tempted to try and impress the hiring manager by sending an old-school follow-up letter after an application, but it’s really not a good idea. We’re living in a digital age where good communication means fast communication. A paper follow-up letter for your job application status can reach the hiring manager too late to make any difference or, worse yet, it might be treated as some unsolicited junk mail and never get opened. Writing a resume follow-up email is definitely your best option. Another week gone and still no response? Begin with asking if it’s a convenient time for the hiring manager to speak with you. If not, ask when you can call them back. Hello [Hiring Manager’s Name], my name is [Your Name]. I submitted my application for the [XYZ] position two weeks ago. I just wanted to make sure you received it and to let you know that I’m still interested in the position. I’d love to talk with you about how I can help you with your upcoming challenges. If you need any additional information, please let me know. The study cited before also found that 46% of hiring managers prefer to be contacted by email, however, 39% were open to follow-ups by phone. Why? Working professionals get hundreds of emails every day (122 on average, to be precise). A quick phone call will help you solve this problem. 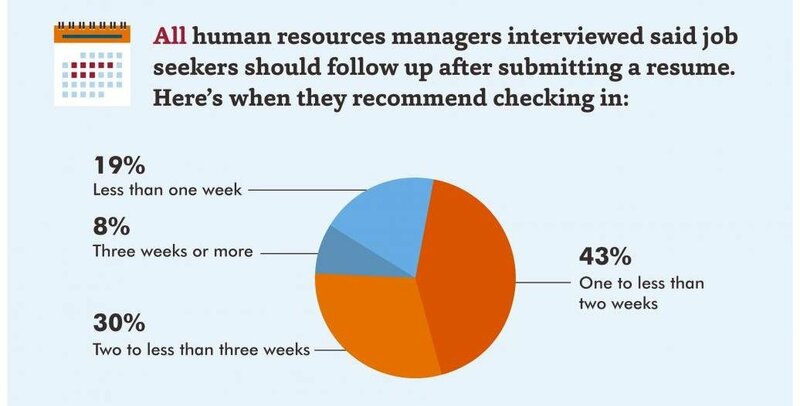 Unless the hiring manager set a response deadline and failed to keep it, don’t follow up more than twice. Accept the fact that a given company might not be interested in you and just move on. Calling or emailing every day or, worse than that, showing up in person to ask about your application will surely discourage the company from hiring you. By the way, it’s plain rude not to respond to any of your follow-ups. If a company doesn’t treat you with respect now, why expect them to do it once you start working with them? Even if you think you’ve found a perfect job for you, don’t give up on applying to other companies while waiting for the response. Don’t obsess over one job posting. No matter how great a candidate you are, you might not make it for reasons beyond your control. There’s one instance in which you don’t have to worry about timelines, employer preference or waiting “long enough”. It’s when you’re offered a position with a different company, but still haven’t heard back from your top pick. If such is the case, follow up straight away. That you’ve received another offer. That you’re ready to turn it down if you’re still in the running. Include a date you’re expected to respond. Sound like too much of a gamble? Well, it might be. But sometimes it’s worth it. I got my current job solely because of the right follow-up. I received another offer, but didn’t really want it. What did I do? Here’s the key: I provided value. Please excuse my bothering you. I’ve just received a job offer which I’ll be happy to turn down if you’d care to have a look at my writing and give me a go. Please find attached a sample article for your blog. Free of charge! Let me know what you think. Trust me, this strategy can work out for you as well. But remember: if you do it, you have to give your prospective employer a sneak peek of your skills. Make them realize that they cannot afford to miss out on you. Pro Tip: Not getting interview invites? Recruiters and hiring managers look up candidates on LinkedIn and other social media platforms. Your online presence might be to blame. When looking for a job, make sure that your LinkedIn profile is up to date and that you’re not sharing anything inappropriate or unprofessional across your online accounts. Read our guide to make the most of your LinkedIn profile: How to Check Your Online Presence Before Recruiters Look You Up. The job application follow-up has two purposes. First of all, to remind the hiring manager about your candidacy. Secondly, to help you put an end to the dreadful uncertainty. Has my job application reached the hiring manager? Have they already seen my resume? Guess what: you don’t have to ask yourself these questions. There’s an easy way to know if and when your resume has been opened. First of all, you can start tracking your emails by using free email tracking software such as MailTag. Sure, knowing that your resume email has been opened doesn’t guarantee that the hiring manager has actually read your resume. But you’ll be able to make an better informed decision about following up. Then again, there’s one more thing you can do. Make an online resume and include the link in your job application email. You’ll know exactly when to follow up and what to say. Following up on job applications might feel awkward, but it’s expected of you. Don’t think you’re “bothering” the hiring manager - you really aren’t. What’s more, a proper follow-up can dramatically boost your chances of landing the job. Here’s a quick recap of the key things to remember. Follow up at least one week after applying. Try to find the hiring manager’s contact details and write a personalized follow-up email. Reiterate your interest in the position and say why you’d perform well in the job. After another week without response, call the company on the phone and make sure they’ve received your application. If you’re offered another job, follow up with your most desired employer right away. Inform them about your response deadline and emphasize that they’re your number one choice. Do you have any additional questions on what to say when following up on a job application? Want to learn more about writing resume follow-up emails? Give us a shout in the comments and we’ll answer you questions. 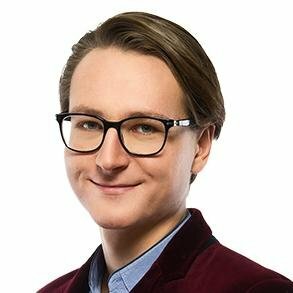 Michael is a career expert and the coordinator of Zety's newsletter. He reaches out to recruitment and hiring gurus to help you learn the most effective strategies for managing your career. Should you put interests and hobbies on a resume? Learn the answer to this question, and pick up 5 tips that will help you do it right. Find out everything about the most in-demand job skills employers value. Learn how to put the right work skills on your resume and start getting callbacks. How to write a resume that will get you the job you're looking for? This step-by-step guide will show you the best resume examples, and you can write a resume in a few easy steps.